Developed in Australia in the 1930s, Polocrosse has been played internationally with great enthusiasm. A logical extension of the Pony Club Games competition, Polocrosse develops strong self-confidence in riding ability while improving eye-hand coordination. Even beginning riders can manage this game that’s lots of fun and encourages them to improve quickly. 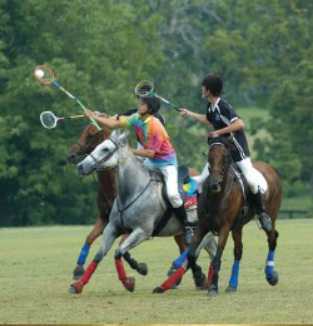 Polocrosse requires practice of ball handling skills – bouncing, picking up, throwing and catching the ball in the net of the racquet, and players learn to cradle the ball to keep opposing players from hitting it out of the net. Basic dressage training is important in developing a good Polocrosse mount, as a horse must have good balance and respond well to the aids. Horses quickly catch on, and seem to enjoy the game as much as their riders! A Polocrosse team for Pony Club consists of three players and a stable manager who may participate as a replacement. Each rider may use only one horse per game, and that horse may not be played more than 64 minutes per day. Horses wear leg wraps and bell boots for protection. Each game period, or "chukka”, is 6 or 8 minutes. Each team usually plays four chukkas per day. Players use a ball made of soft rubber that bounces well and is caught, thrown or carried in the net of a cane racquet.